Not all pest control options are created equal. You’ve probably seen a home tented, but when is this really necessary? Fumigation, also known as “tenting,” is a treatment for the complete extermination of pests. Tenting is a drastic measure used to rid a structure of a severe infestation. Fumigation is also used on shipping containers to kill any exotic pests from overseas. General pest control, however, is a more localized approach for smaller problems such as rodents, carpenter ants and roaches. 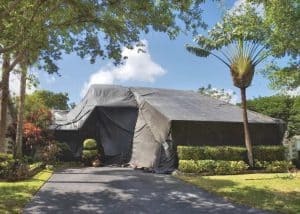 Most commonly, tenting treats a serious termite infestation. All food must be properly stowed and all people and pets removed during treatment. For more information on pest control services in Frisco, TX, call Safe Pro Pest at (972) 435-0700!